← Play in Nature……….Which is Real? My Mother used to say “Go Outside and Play!” and I would say “with who?” Then I would grab a book and read under a tree somewhere. Parent’s today are afraid to say “Go Outside and Play!” Parents are afraid that their children will be bored, they are afraid their child will be kidnapped or worse ( thank you CNN and television dramas like Law and Order SVU) Most of all parents are afraid they will be seen as BAD parents. 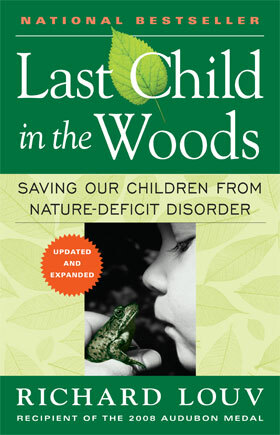 All of these things are outlined in Richard Louv’s first book Last Child in the Woods . 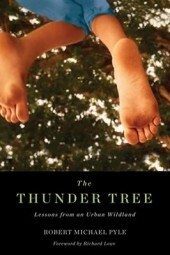 Last Child in the Woods talks about the Extinction of Experience that Robert Michael Pyle wrote about in the Thunder Tree. The fear really doesn’t go away even if the children are 24 and living in a completely locked up safe apartment in the next town over. We have to learn to allow our children to LIVE, and to trust that we have taught them to be safe, and to trust their instincts. Trusting your instincts is a much better skill than knowing how to lock the door and stay inside! The world isn’t more dangerous now than it was then – we just have CNN now. CNN and other news channels run the same things over and over and over about the same children. Really – there are statistically about the same number of abductions and murders than there were in the 1950’s, we just see them more now on television. Somewhere along the way we taught children to stay in side and lock the doors while we are gone. Some of that was because both parents generally work now. Some was because we were afraid. Somehow it got turned in to stay inside while I am home and now…………we don’t want our kids to get dirty at all and we feel we have to entertain the children all day with some game or other. The kids have unlearned the ability to entertain themselves. They are BORED! How many times have you heard that word? They want something or someone to entertain them. We send them to camp, to baseball and soccer practice and have a coach entertain them and we stay there with them while they play so that their self esteem is not ruined because mom takes her gaze away from them for one second. Really it is guilt. Guilt because we work or guilt because we feel they aren’t getting enough of our time. Actually it is the QUALITY of that time not the quantity of time. That time and attention can be anything and can be anywhere. It just takes focus. Time spent outdoors is fabulous. If you have a small child (preschool age) you can spend HOURS and HOURS just sitting by a creek and letting them throw rocks. They are learning while they do this too. And when they learn that the rock sinks or if they throw it hard it goes farther or whatever concept is swirling around in their head at the moment………….they move on to the next thing. Maybe it is picking up sticks or breaking sticks or crunching leaves. All natural, normal, fun things for children to do. Best of all……….when they get home they are tired. Really tired! This entry was posted in Childhood, Children in Nature, National Parks, Nature Play, Play in Nature, play outdoors, Preschool, Preschoolers, Uncategorized and tagged children, children and nature, Children and Youth, gardening, gardening iwth children, kids, kids n nature, Little Sprouts, Louv, nature, nature play, outdoors, outside, Pilcher, Pilcher Park, Play outside, playoutdoors, preschool, preschoolers, Richard Louv, Summer fun, things to do with kids, travel with children, travel with kids, trees. Bookmark the permalink. 4 Responses to Mom says “Go outside and play!” Now What? Thanks for sharing these wonderful resources with us. it’s always exciting to see more educators are advocating for reconnecting children (and adults) to nature and outdoors. Tim Gill is another great thinker and advocate for children’s rights to free play and he talks a lot about our cultural approach to risk taking and the fear factor too. Just discovered you through Twitter. I love your play in nature theme. We do a lot of this through adventure travel with kids and recognise so much of what you say. Boredom is not outside but inside, inside you! (well not you personally) When you turn your attention outside and up close to the amazing things in the natural world all around us, how could you ever be bored! There are many challenges in our consumer and ultra “civilized” culture in trying to help kids (and adults) (re)connect with nature, but kicking kids outside is one great small way forward. I wish someone would do it to me sometimes. We’ve written about this on our site also, so drop me an email if you’d like some links.